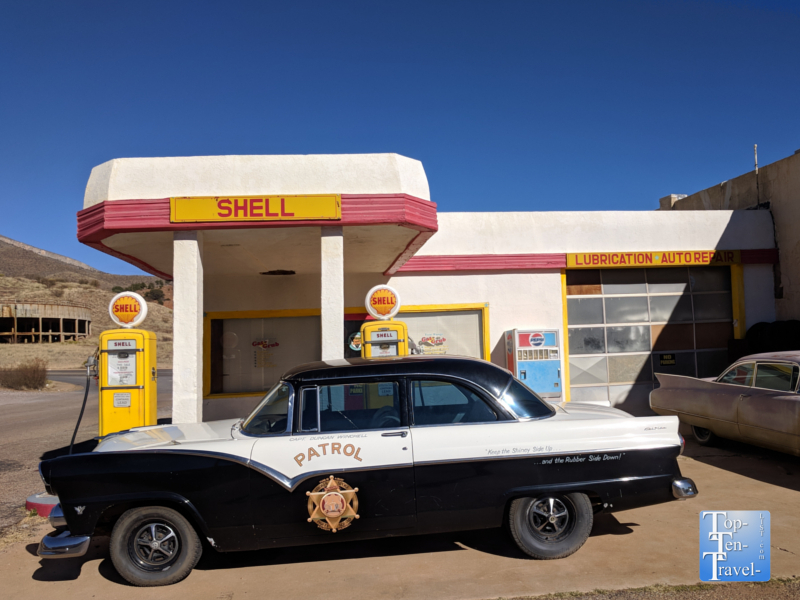 Bisbee, Arizona: Former Copper Mining Town Turned Popular Tourist Destination - Top Ten Travel Blog | Our experiences traveling throughout the US. Bisbee Arizona is a small city about 92 miles Southeast of Tucson, and thus, most popular with Tucson vacationers and locals seeking a quick daytrip. The historic architecture and picturesque location in the Mule Mountains is just one reason that tourists are drawn to the town. The abundance of local shops, galleries, and restaurants is another. The town also sits at an elevation of 5575 feet, which means it’s a bit cooler than Tucson during the brutal summer season. Above all, the town is most famous for being home to the Copper Queen Mine. 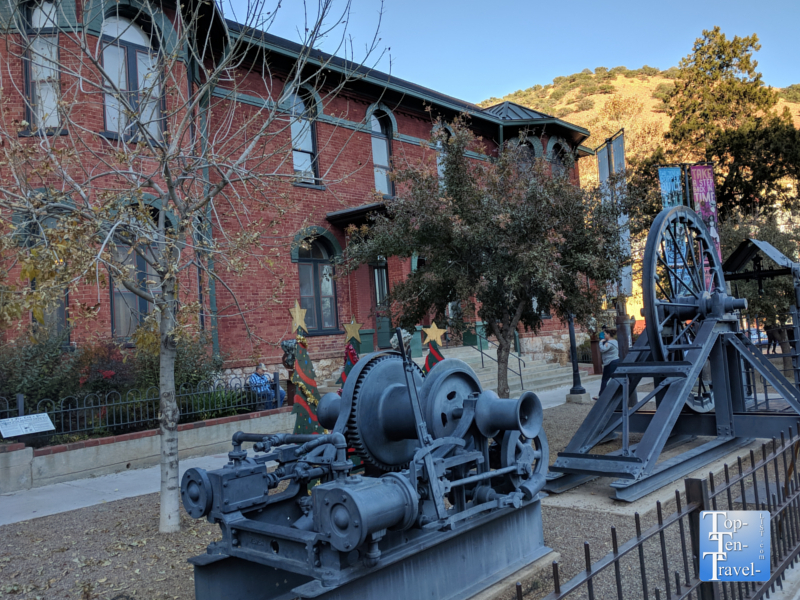 Bisbee was founded in the 1880’s and was once a thriving mining community due to the vast amounts of copper, gold, and other precious metals found in the area. In 1908, Bisbee had nearly 20,000 residents (the most in Arizona) and was referred to as “the liveliest spot between El Paso and San Francisco.” Impressive amounts of copper, gold, and silver were mined (8 billion pounds of copper). 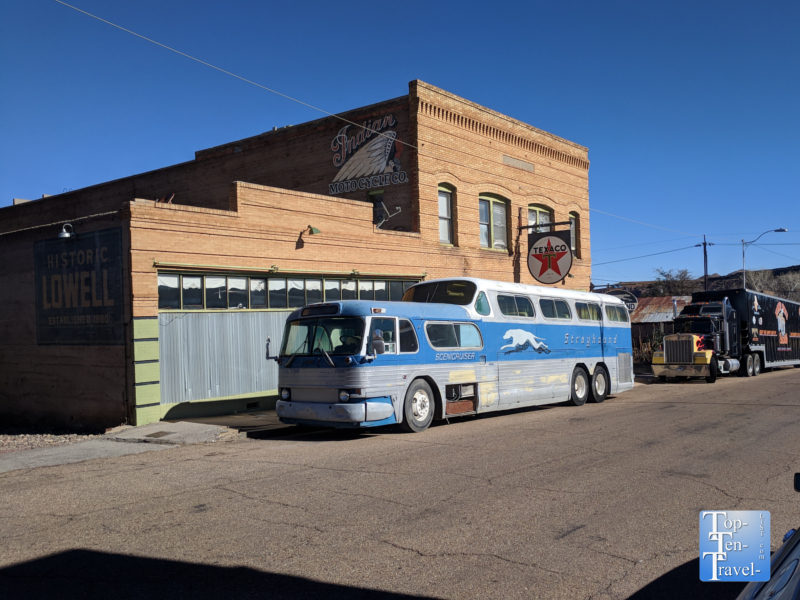 Eventually the mines shut down as the reserves were exhausted and by the 1970’s Bisbee started to resemble a ghost town – that is until the quaint town began to draw attention from artists, hippies, and tourists whom appreciated the distinct flavor of the area. Creative types began to flock here and continue to do so to this day for the eclectic shops, unique vibe, strong artistic culture, and interesting lineup of events such as the Bisbee 1000, a unique 4.5 mile race/walk featuring a 1000 step stair climb! The downtown was eventually built up with numerous attractions, restaurants, breweries, art galleries, shops, and museums, although many charming Victorian style buildings still remain. Bisbee has won numerous awards in recent years including “best historical small town” by USA Today and “Best small town in the West” by Sunset Magazine. I would have to disagree with these awards as I found the town (as well as many others in S. Arizona) extremely overrated. Nevertheless, it’s another daytrip option, particularly if you are interested in mining, antique museums, and art related events. More than a million tourists have come from all over the world to tour the Copper Queen mine since its’ opening in 1976. If you take a mine tour, you will get to put on a yellow slicker and miner’s hard hat and take a little ride underground to view the mine. You will learn more about the history of mining as well as some of the dangers workers encountered while working underground. Many of the tour guides actually worked in the mines, and thus, have some valuable first hand knowledge. As a word of caution – those claustrophobic should avoid this tour. And please be aware that closed toe shoes without heels are required. You may also want to check out the Bisbee Mining & Historical Museum after your tour. 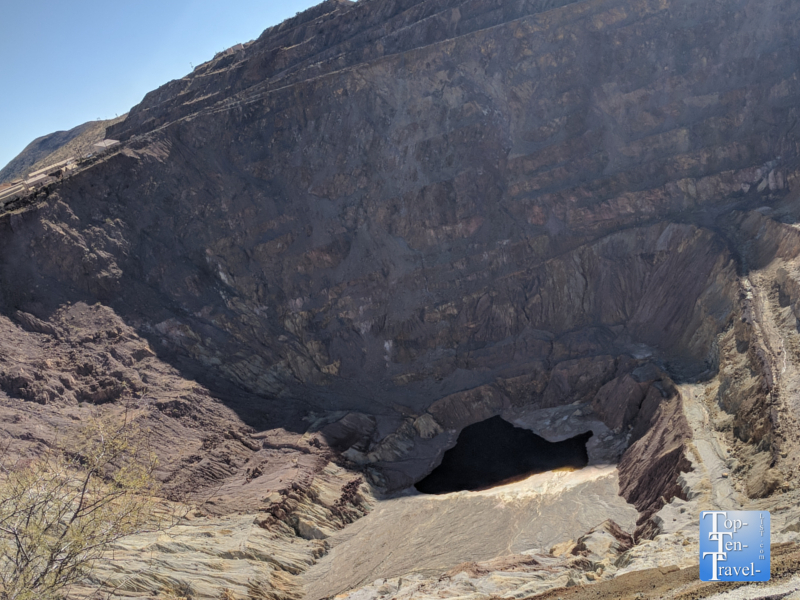 Another must-see in Bisbee is the Lavendar Pit, a former open pit copper mine. Production through 1974 included over 600,000 tons of copper. Gold, silver, and turquoise were all byproducts of the mining. This type of turquoise, which is referred to as “Bisbee Blue,” is known to be one of the finest in the world due to the striking hue. There is a large fence in front, although you can still get a pretty good view. The historic Copper Queen hotel is a popular lodging choice as it is located conveniently in the midst of the downtown. 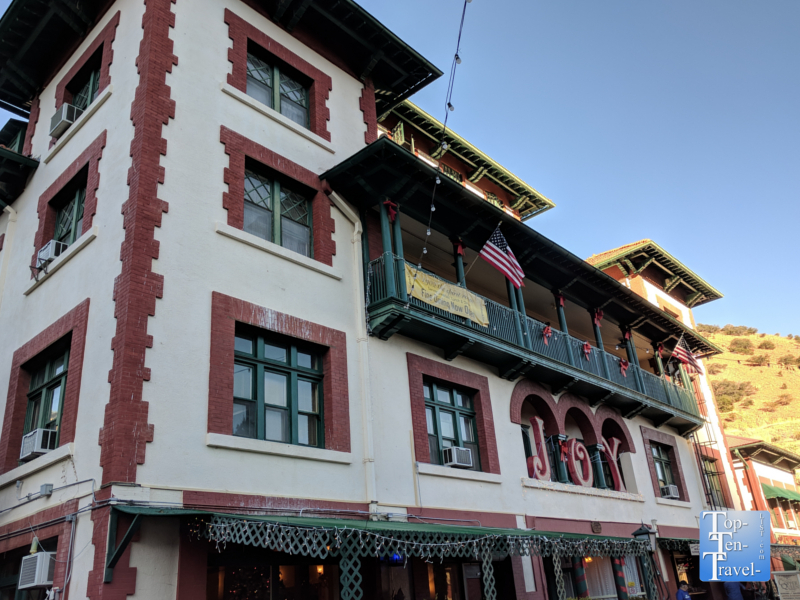 The hotel is rumored to be a hotbed of supernatural activity, and thus it is no surprise, that both Ghost Adventures and Ghost Hunters featured the property on their shows. The hotel was built in 1902 as a place for the investors of the Copper Queen Consolidated Mining Company to stay. It the longest continuously operating hotel in Arizona. Many famous celebrities such as John Wayne, Nancy Reagan, and Julia Roberts have stayed here. 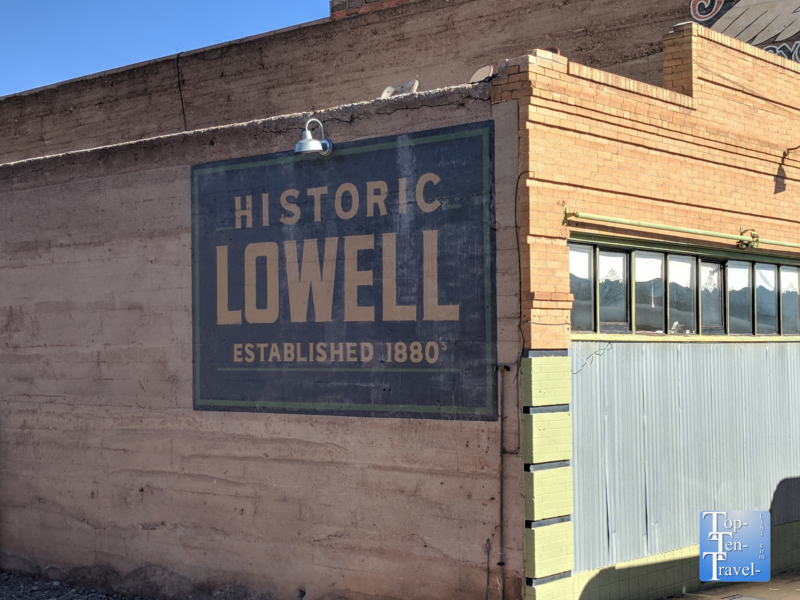 One of the most interesting things to do in Bisbee is visiting the nearby ghost town of Lowell, Arizona which is just 5 minutes outside of town. The town consists of just one street, appropriately referred to as Erie Street. 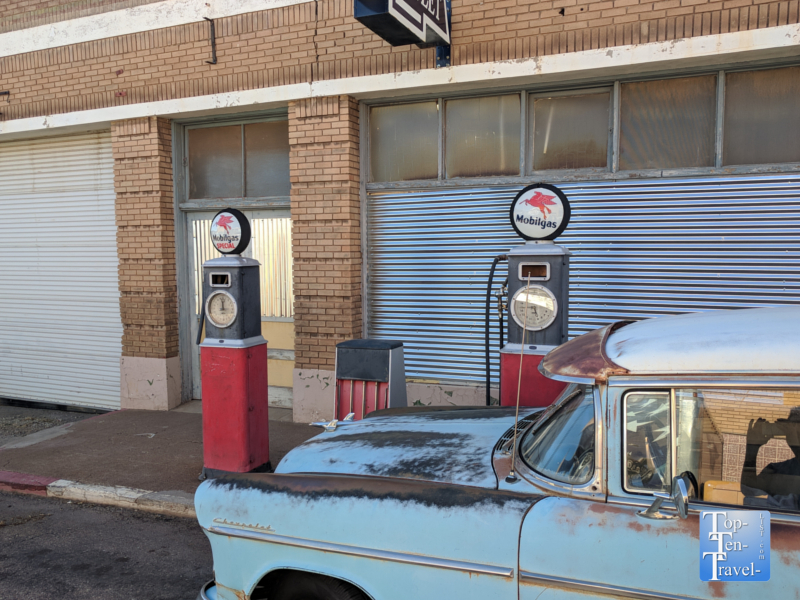 Walking the street is a nostalgic step back in time as you pass a bunch of historic abandoned storefronts like a Greyhound Station, a police station, a Harley Davidson store, and a Texaco gas station complete with the old pumps. 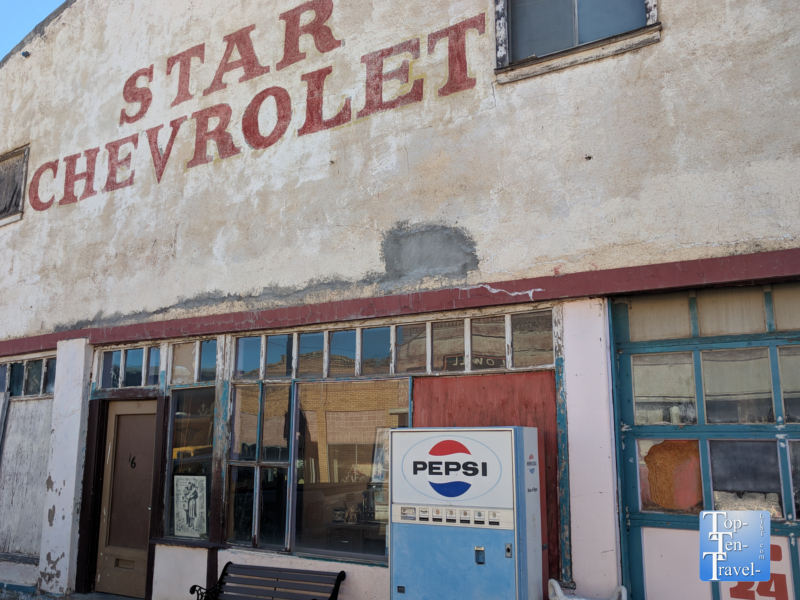 I really was not a fan of Bisbee overall, however, I did really enjoy strolling around the ghost town. It truly was an interesting experience to walk down the street and imagine how life was back in the day. Bring your camera – lots of fun photo opps and classic pics to bring home as mementos. On an interesting side note, the 2006 Stephen King movie Desperation was filmed here. 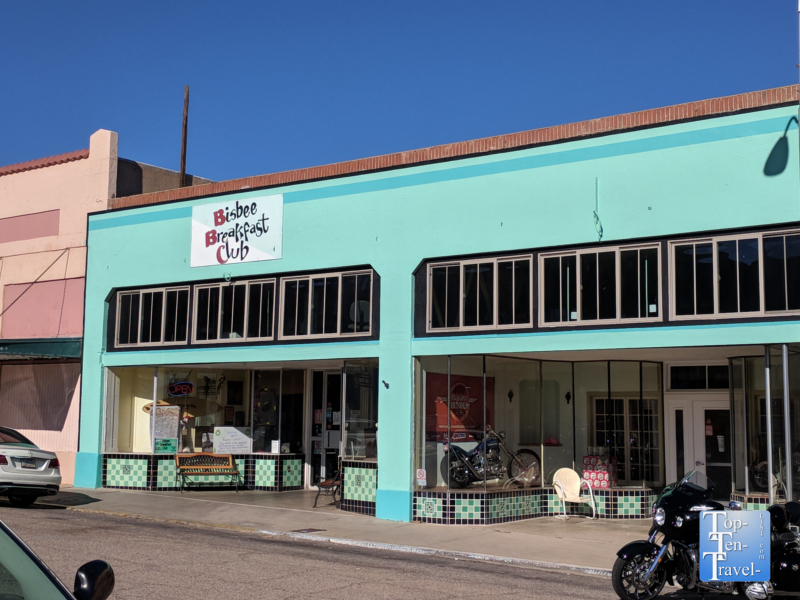 While over in Lowell, be sure to check out the Bisbee Breakfast Club. 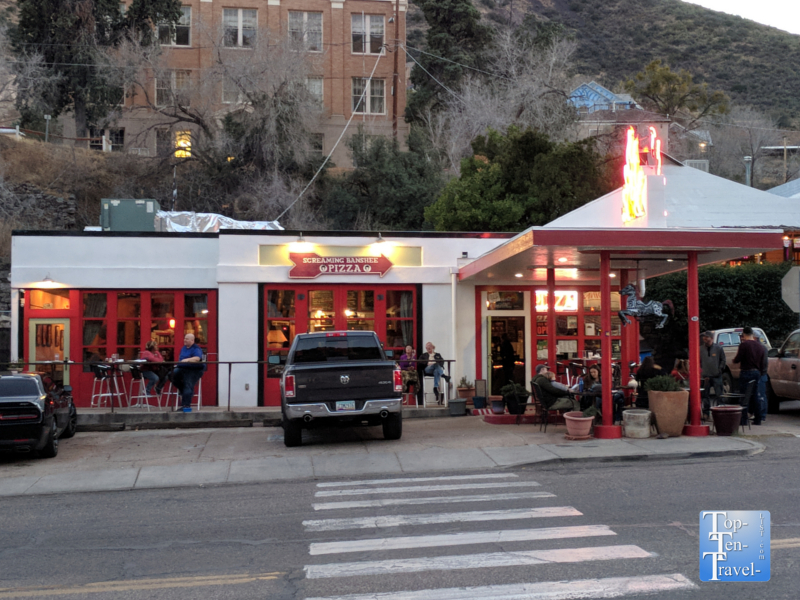 Despite being touted as a foodie town, the restaurant scene in Bisbee overall is pretty uninspiring and consists mainly on general cafes and overpriced tourist traps. The one exception is the classic Bisbee Breakfast Club which opened in 2005 in the historic Rexall Drug building in Lowell. 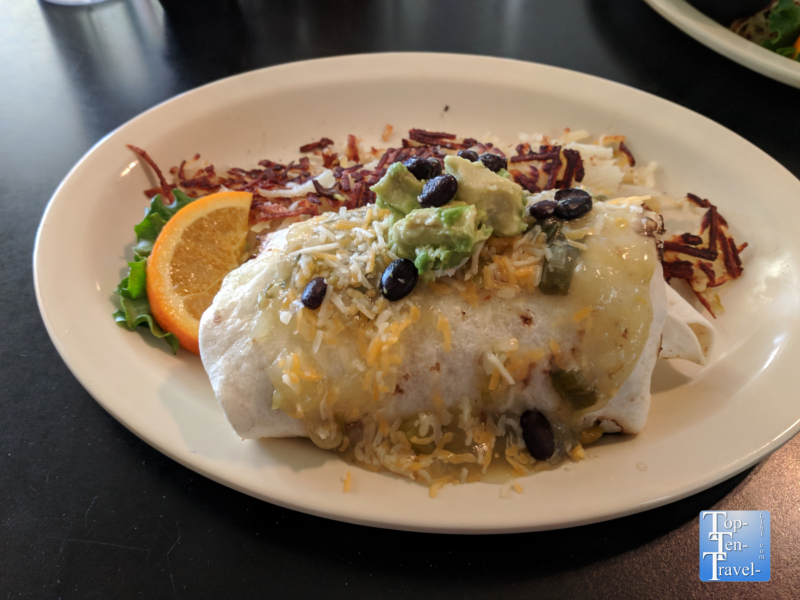 The Southwestern style breakfast hotspot was so popular with Bisbee locals and tourists that several locations have sprouted up throughout Southern Arizona. The ambiance is casual & comfortable with an attractive old time feel, complete with some classic oldies playing in the background. You will find all the typical American favorites here, plus a few Southwestern specialties. The restaurant has a great hometown feel and is the perfect choice for any new visitor. 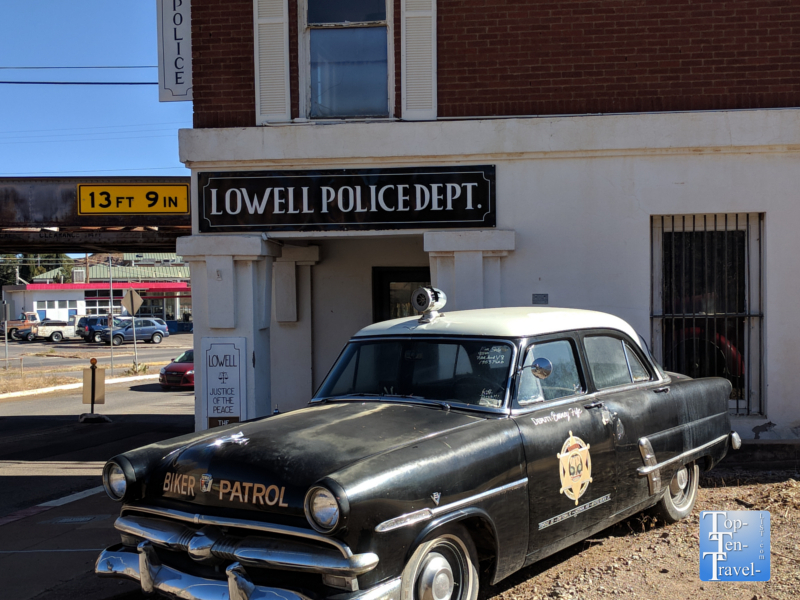 While not the best breakfast I’ve ever had, the food was decent enough to warrant a visit and the historic ambiance fit in with the ghost town. 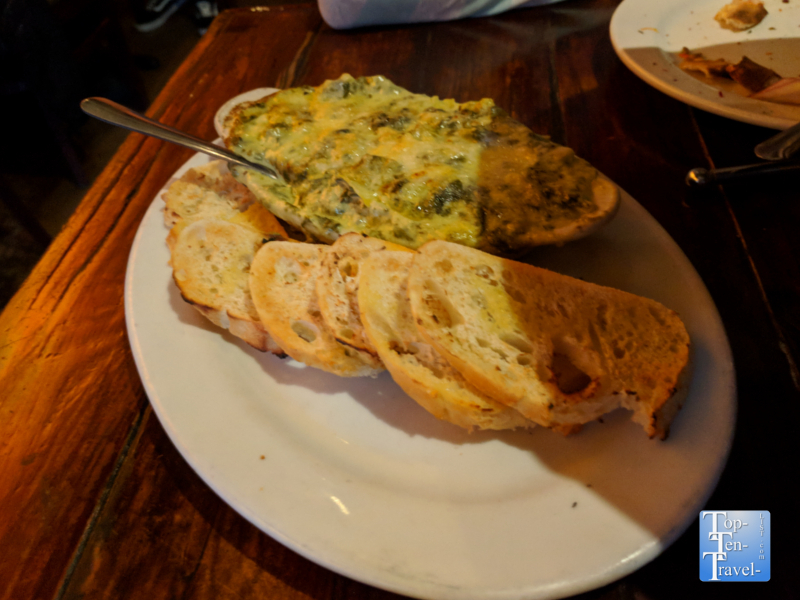 In terms of Bisbee dining, it’s your best bet. 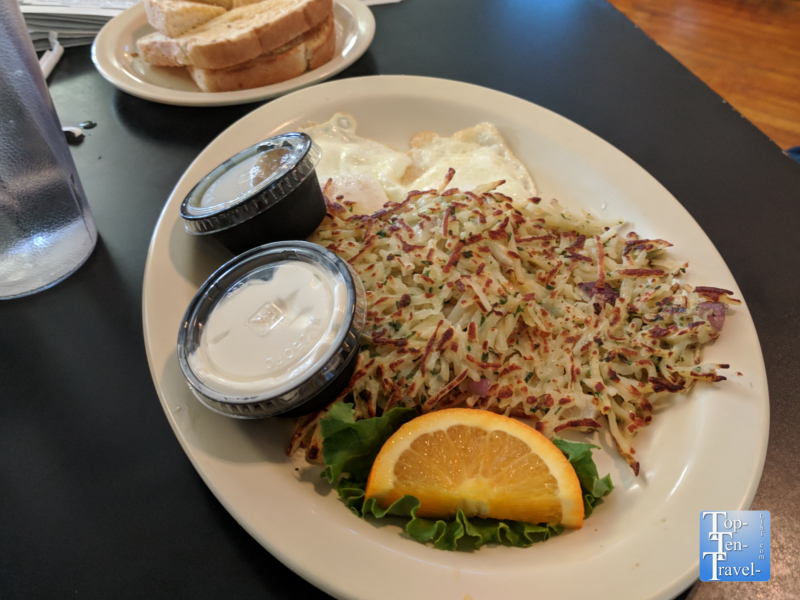 I recommend trying out DJ’s Potato Cakes, 2 homemade potato pancakes served with sour cream and applesauce, with 2 eggs your way on the side. If a lengthy wait bothers you, avoid at all cost on Saturday and Sunday mornings or at least get here early to beat the crowds! I would skip the coffee here and rather head over to the Bisbee Coffee Company for an expertly made espresso drink. This artisan roaster has been in business since 1997. Their espresso drinks are fantastic, as is the charming atmosphere. The outdoor patio is a great place to treat yourself to an espresso while people watching on a mild summer’s day. 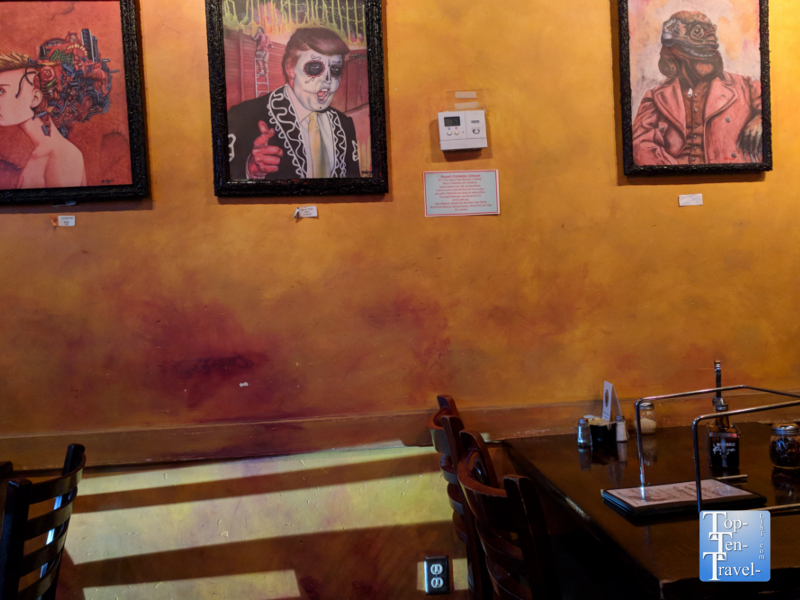 If you are looking for a great place for lunch, options include a number of small cafes, Mexican restaurants, and a number of breweries. 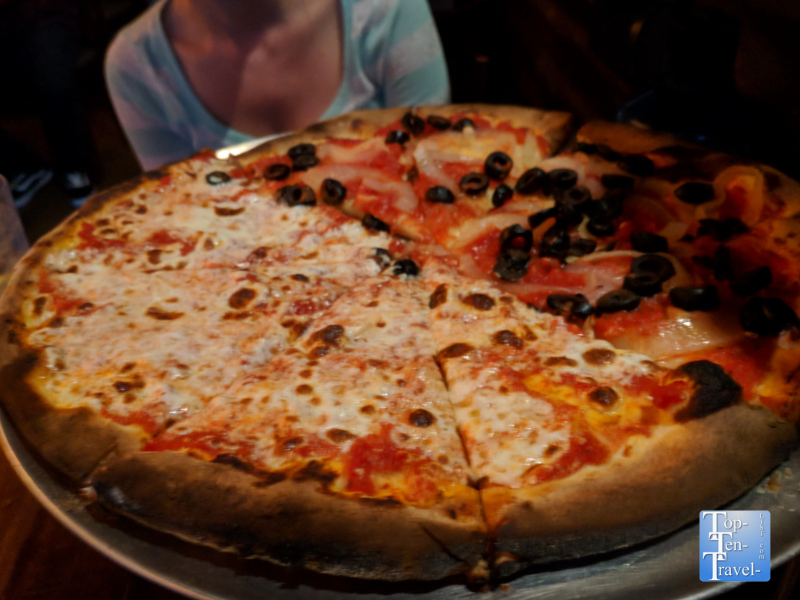 Screaming Banshee Pizza, although overpriced and a bit slow on the service side, serves up some tasty appetizers and pretty decent pizza for a small town. The eclectic decor and unusual location inside an old gas station make it a bit more interesting than some other basic choices in town. 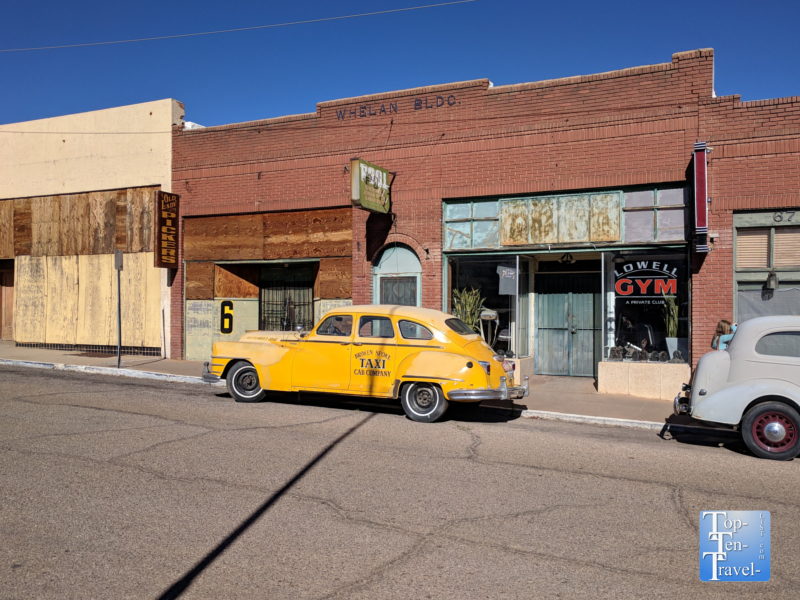 Other popular attractions in Bisbee include ghost tours (the town is one of the most haunted in America), the Bisbee Restoration Museum, and as mentioned earlier, shopping at antique stores and taking in the unique art scene at the galleries. 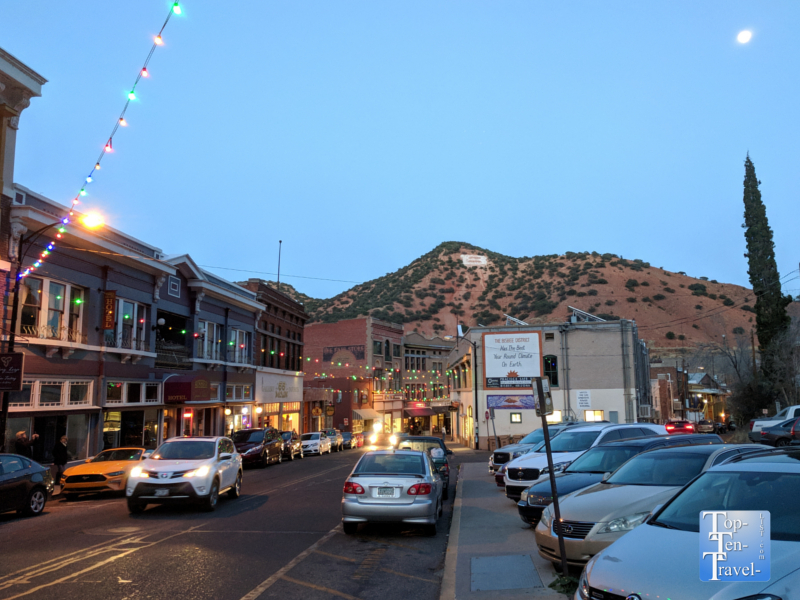 Bisbee holds a very popular monthly art walk known as Bisbee After 5, so if you are an art lover you may want to time your visit on the 2nd Saturday of the month. During this time, there are numerous special exhibits and many shops stay open late. Honestly, I thought the town itself was a bit dingy and overrated. 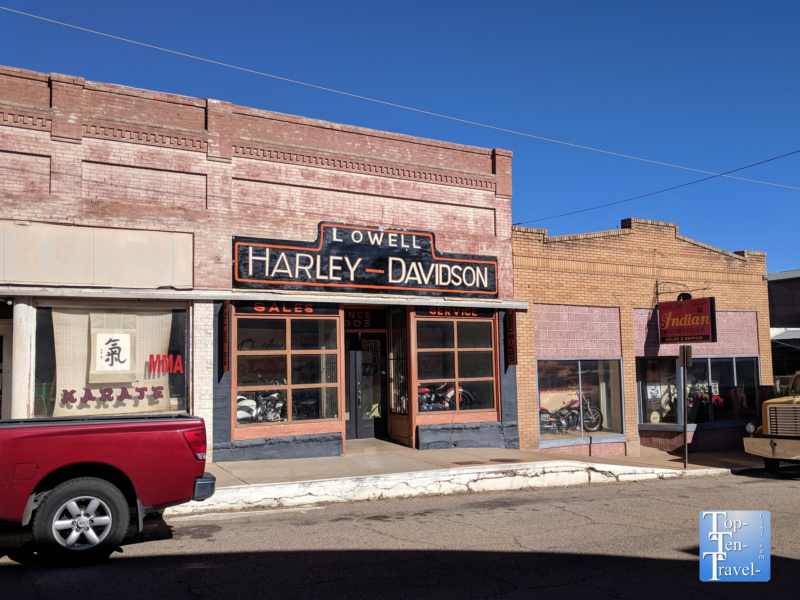 While some aspects were great, namely the unique ghost town remains, the interesting architecture, and the abundance of antique shops, the overall vibe felt a bit dreary. There really were not enough attractions and sites of interest to warrant a daytrip in my opinion, although this would likely not be the case for those very interesting in either mining or art. 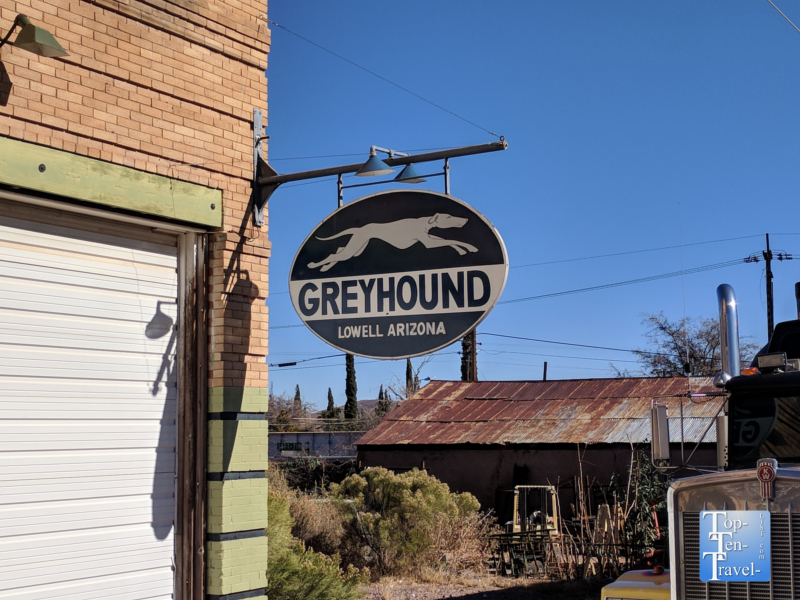 I would only advise taking a daytrip here if you are looking for more to do and have already explored better Southern Arizona destinations like Madera Canyon, Saguaro National Park & Tucson Mountain Park.